I came into this week with high expectations. I leave a little bit disappointed. I had really wanted to learn how to get exciting programs like ESY started ($wise) and accepted (attitude-wise) all across America. I wanted to create lesson plans then teach them to the children, so that I could see exactly what I need to work on in educating this population. I learned that ESY NOLA is funded by basically two things: Alice Waters, the chef who first began ESY in Berkley; and FEMA money from Hurricane Katrina. Since celebrity chefs are hard to come by, and you can’t make a hurricane happen or a government screw up their response, it’s not all that likely to be able to fund this kind of project in any old place. Additionally, the program is run in charter schools, which give them a lot more flexibility in terms of the curriculum. It may not even be possible to squeeze it into the packed teach-to-the-test lessons in public schools. Or, if it is, I got no closer to solving that problem this week. Although I did get to create a lesson plan, it was simply taken from me and will be used next week. I did get the chance to observe some classes, but didn’t get the chance to add anything to those classes for which I was present. Most disappointingly, I put a lot of work into planning several event that are going to happen in the future: National School Lunch Week and Food Day. Although I knew from the outset that I wouldn’t be present for these events, I figured that my hard work would not go to waste. However, for the last two days of the week, after all the planning and research had been done, Aly and I were used as extra hands during our time at the rotation instead of being allowed to put our work into some format that could be utilized by ESY or built upon by future interns. Friday was the worst: the first four hours of the day were spent trying to get printers working, then printing, cutting, unwrapping, and stuffing 150 table toppers. We were asked to deliver them to schools all around the city, but we had missed so much (classes, meetings) by the time the work was done that we had to leave immediately for a career fair that we had been asked to present at. 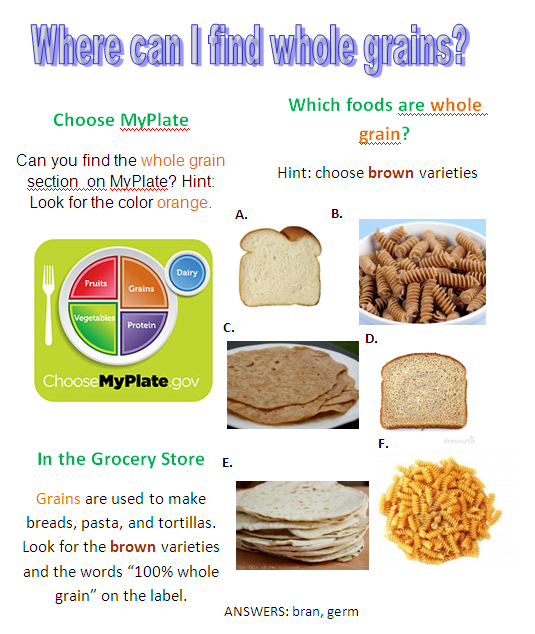 Oh, who designed that fun and informational whole grain content? Yes, it was me! I thought you’d never ask! 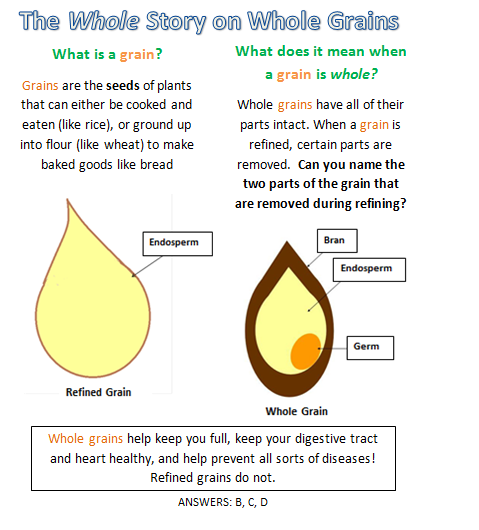 As you can see, I basically took my post on here about whole grains, shrunk it down, took out a lot of big words, added more pictures and games, and voila! A little light lunch time reading for the students in the five First Line Schools. It was a big challenge to make appropriate content for the young kids, especially when discussing benefits of different foods. You can’t give em the old “fiber will keep you regular!” because discussion of pooping is never a good idea until sophomore year of college. Also, a lot of foods have protective properties for chronic disease, and kids that young don’t really make the connection that what they do now can affect their chances of diseases like cancer and cardiovascular disease. I also figured it would be a bad idea to talk about things that might be scary. Kids (adults too) can cling to one piece of information and give it far more importance than it merits. If, for example, I were to say “Lycopene is what gives tomatoes their red color, and it also prevents cancer” you can bet there would be one little girl going home and requesting tomatoes for breakfast, lunch, and dinner. 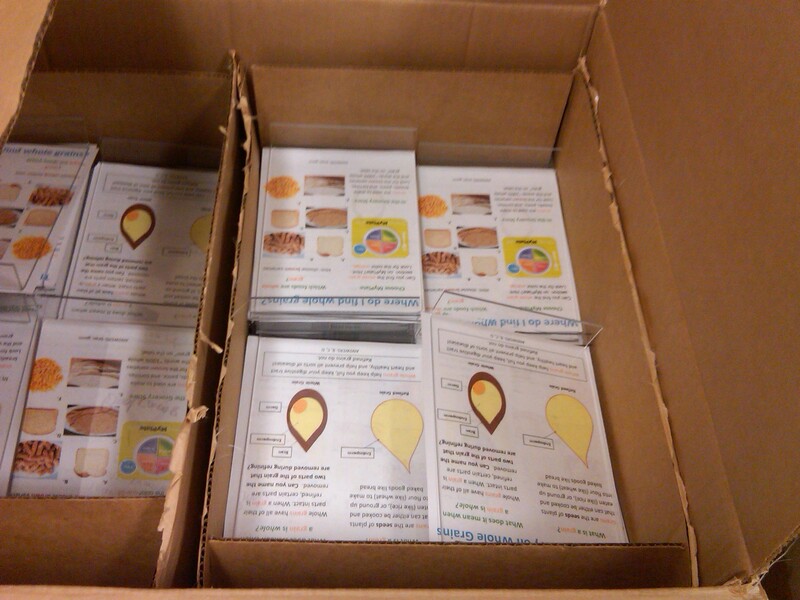 So often in nutrition, we talk about readability and making materials accessible to different populations, but I’d never worked with kids before. Learning effective communication with them is definitely the most important thing I took from this rotation. 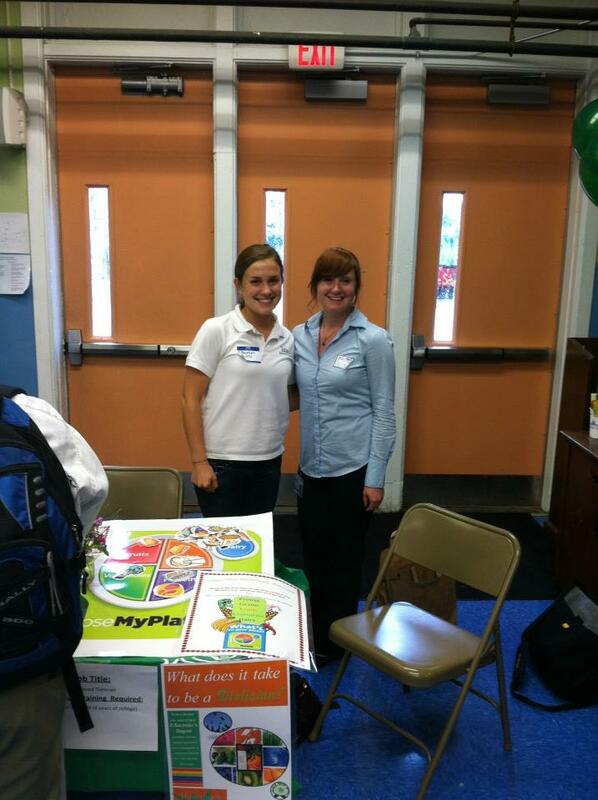 The career fair at Green Charter School was by far the best part about Friday (except teaching at Hour Blast). They were actually really excited to play our little MyPlate game, so wonderfully constructed by my counterpart Aly. She was awesome to work with this week, her passion for health and good food (she is a graduate of Johnson and Wales) is so apparent in every conversation with her. Watching her talk to the kids was a lot of fun – I swear she could go on for days about how great the field of dietetics is! Me, Aly. 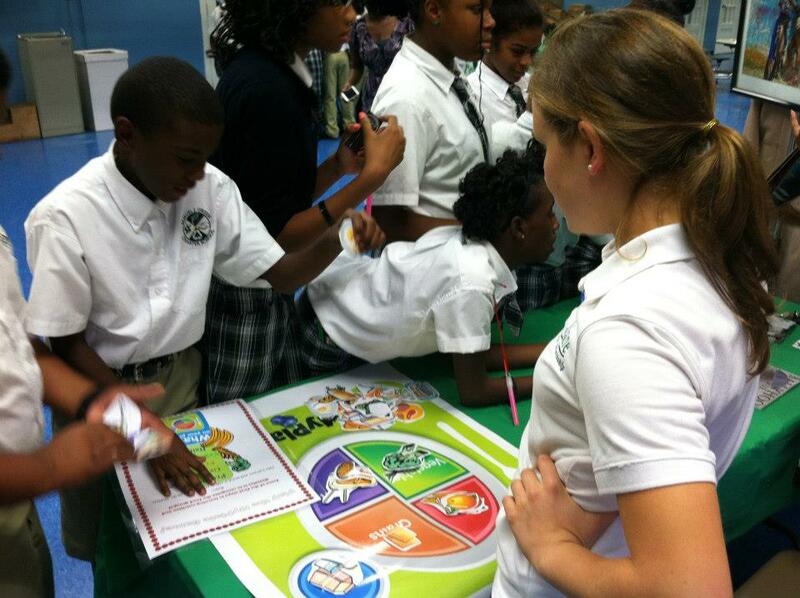 First annual Green Charter School career fair and the end of a long week! This entry was posted in Dietetic Internship and tagged career fair, dietetic internship, Edible School Yard, First Line Schools, food education for kids, health literacy, Tulane Dietetic Internship. Bookmark the permalink.